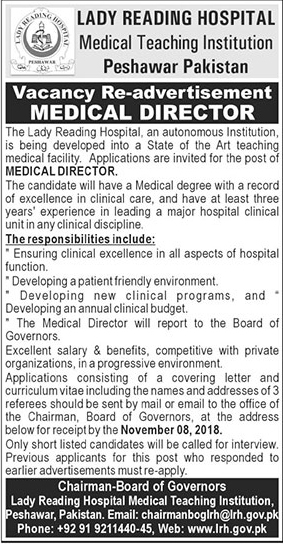 Lady Reading Hospital (LRH) Peshawar Khyber Pakhtunkhwa. The candidate will have a medical degree with a record of excellence in clinical care, and have at least three years experience in leading major hospital clinical unit in any clinical discipline. Application consisting of covering letter and curriculum vitae including the names and address of 3 referees should be sent by mail or email to the office of Chairman Board Of Governors, at the address below for receipt by November 08, 2018. Previous applicants for this post who responded to earlier advertisements must re-apply.